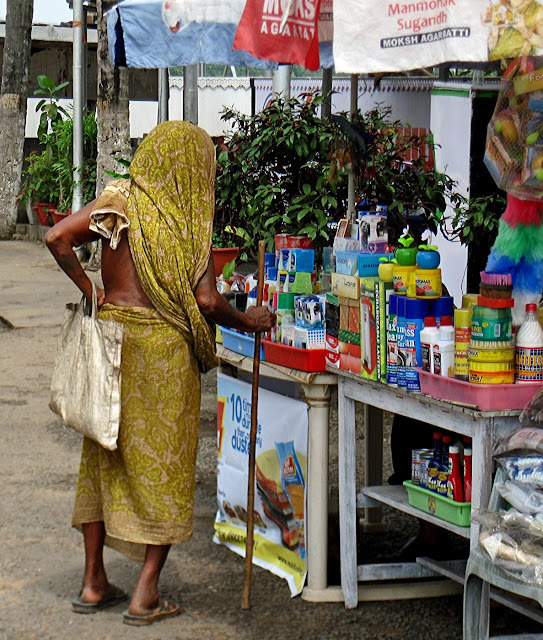 These are photographs of old and elderly women photographed on the streets of India. None of these women were seen begging. 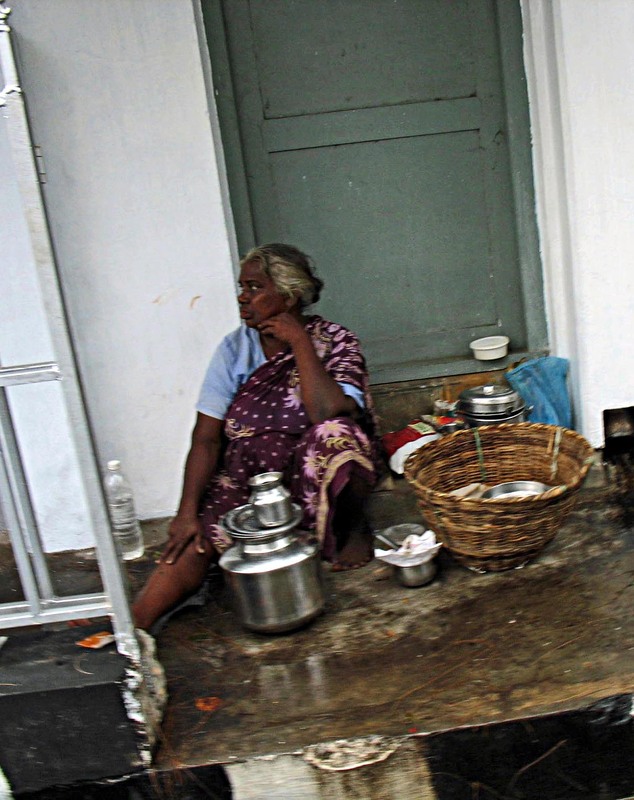 It is known that the poor elderly have a difficult time in India, often abandoned by their families because of poverty. 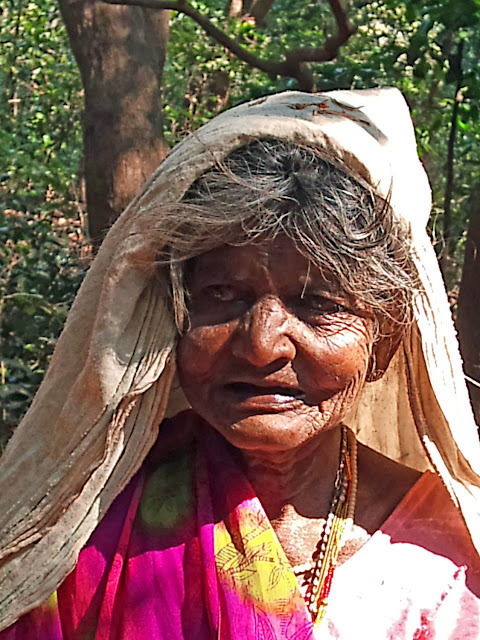 This portrait of an old woman was shot in the forest of Matheran. 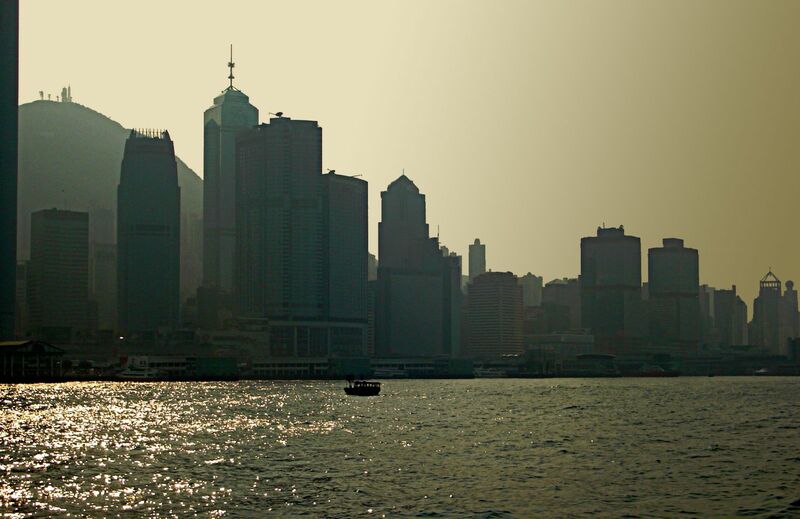 The picture was shot on a cell phone, a Sony Ericksson which has a decent camera function. The woman's eyes seem clouded, perhaps with cataract. She could barely see. Her skin was leathery, her hair uncombed and a piece of cloth over her head protected her from the sun on the hills of Matheran. She was wandering about alone, looking for firewood. She was not a beggar, nor a destitute, just poor. 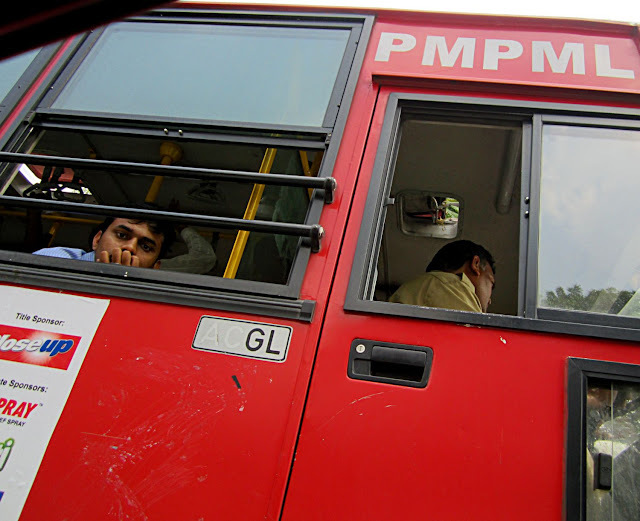 This picture was taken in a town in North India. The woman seems partially dressed and poor, but she was not begging, but she was possibly a beggar or destitute. This photograph was taken in Puducherry in South India. The woman was resting on the streets and was probably a poor saleswoman. 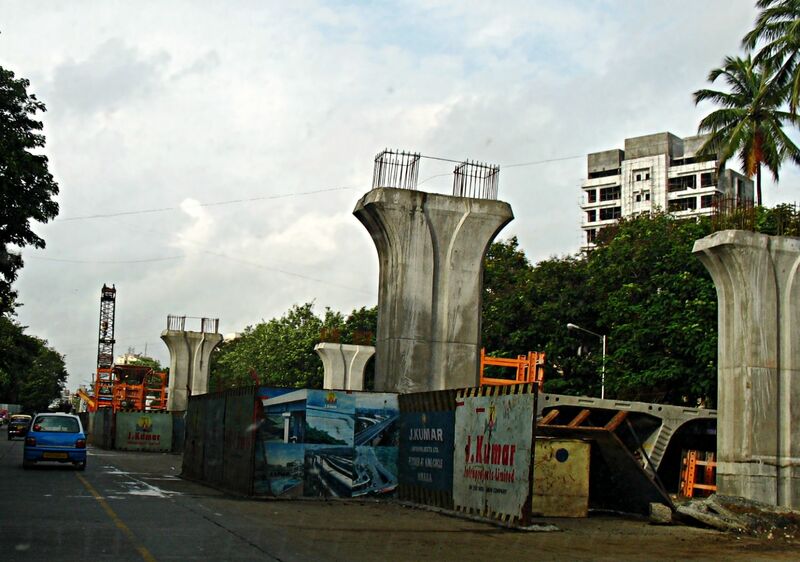 The photograph below is part of a larger photograph. 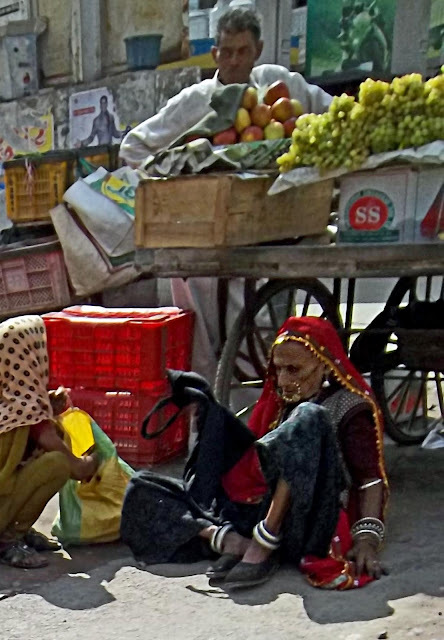 The old woman villager is resting in the shade of a vegetable cart, to protect herself from the harsh sun of Rajasthan. She is wearing a large nose-ring. Her large and chunky jewellery is very much part of the traditional dress amongst tribals in that region. This photograph juxtaposes women from two different backgrounds. 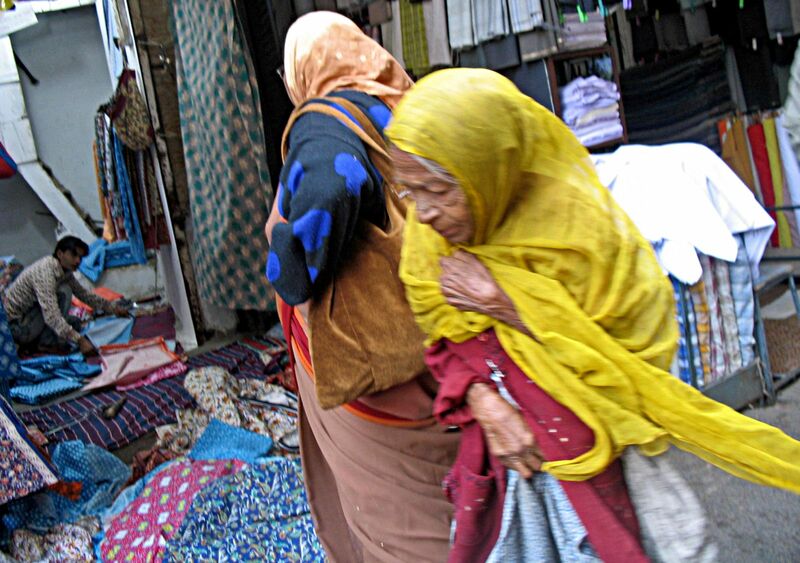 Taken in a busy cloth market in Ahmedabad, Gujarat, it shows a middle-class woman looking at the wares in the cloth shop. 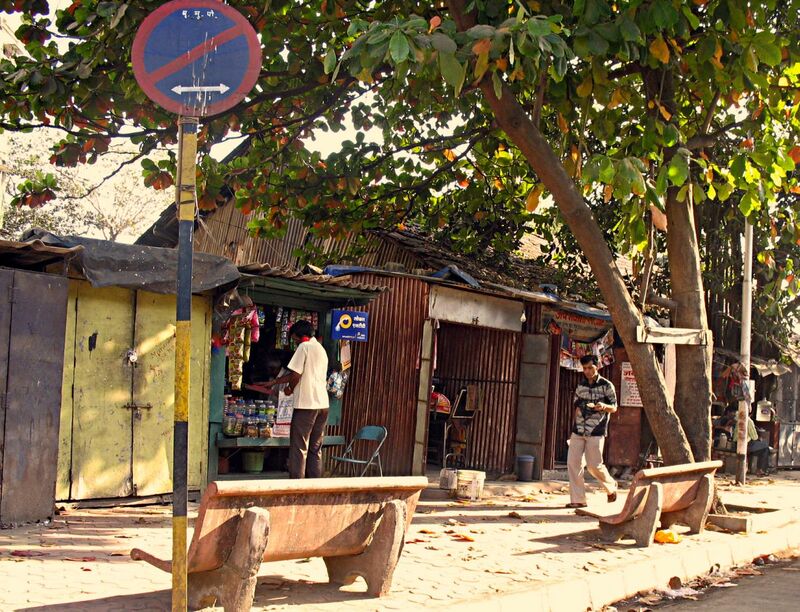 A poor scraggly woman passes her by, shivering in the cold winter of Ahmedabad. 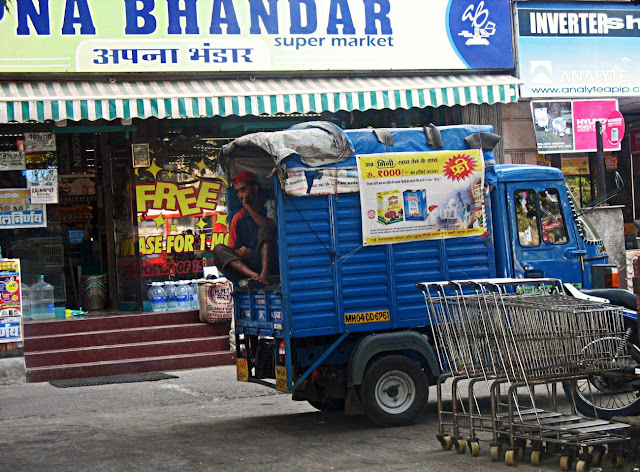 Small retailers or what can be called Mom and Pop Stores or Kirana stores are the life of retail in India. 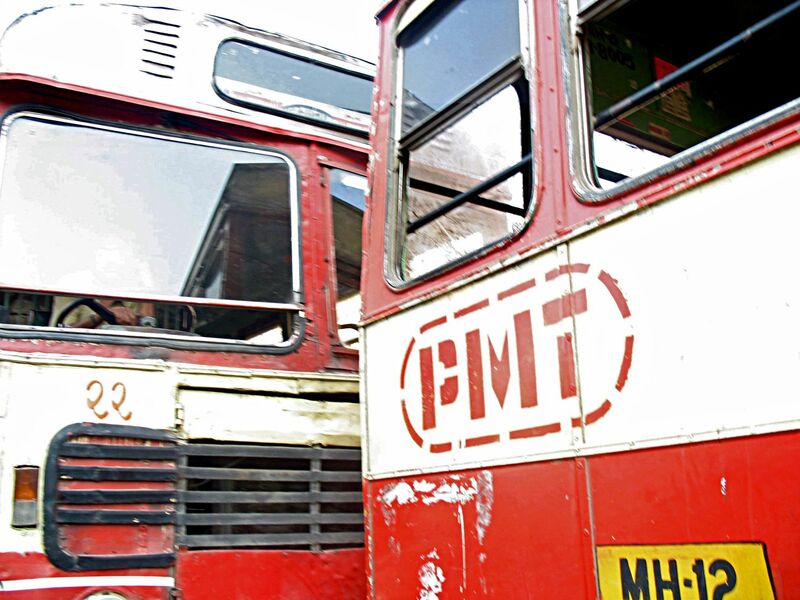 They dot the country, in small towns, villages and cities. They are of all shapes and sizes, catering to the rich, the middle class as well as the poor. They create entrepreneurship opportunities for the common man. 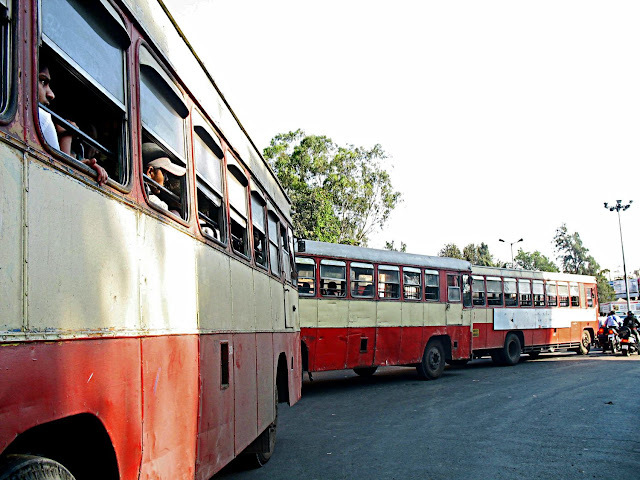 They are to be found at every corner in most cities, walking distance from residential localities. 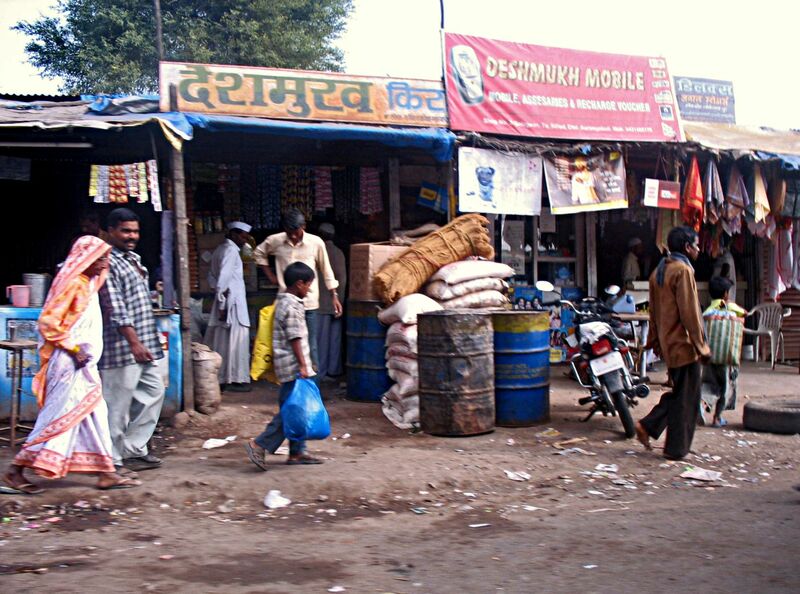 These are a row of shops in a crowded streets. They often call themselves "General Stores" and by that they mean that generally everything of daily use can be found here! 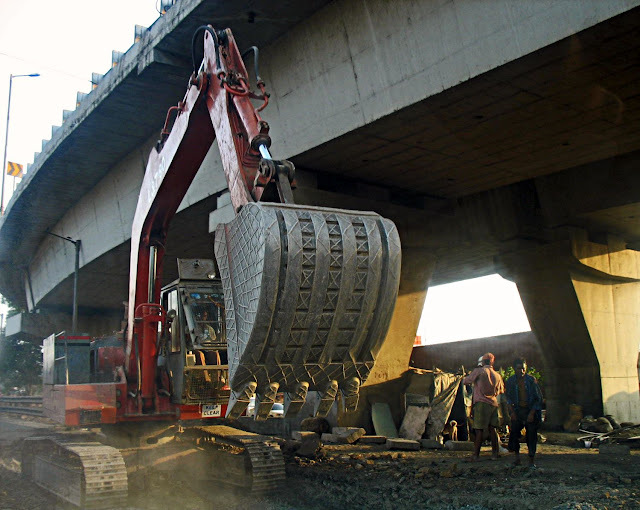 This means goods ranging from food grains and processed foods to stationary items. These are not self-help shops but have several people behind the counter who offer immediate service. This is what the inside of a general store can look like. It can be crowded inside, and impossible to step in. The shop-keeper is the only one who can find what you want! 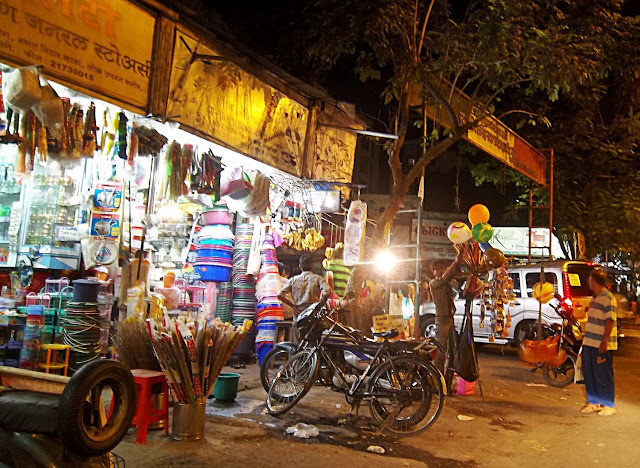 These are often called kirana shops. This is a small store which calls itself a supermarket, catering to the middle-classes. 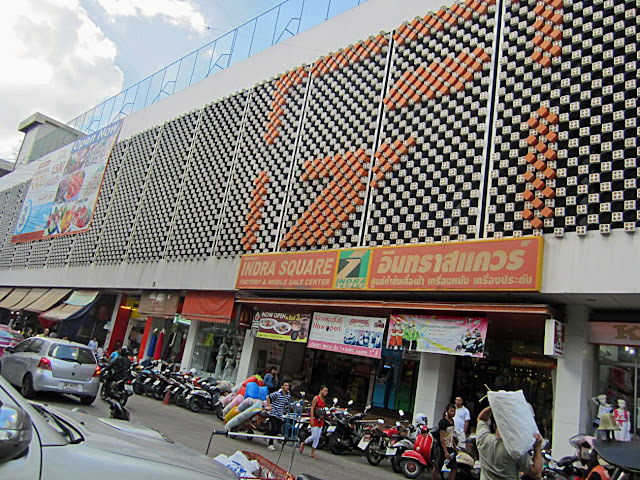 In a way it is although it is cramped and crowded inside because it is a self-help store which stocks daily-use items. Another small store calling itself a "convenience mart" for the better-off. 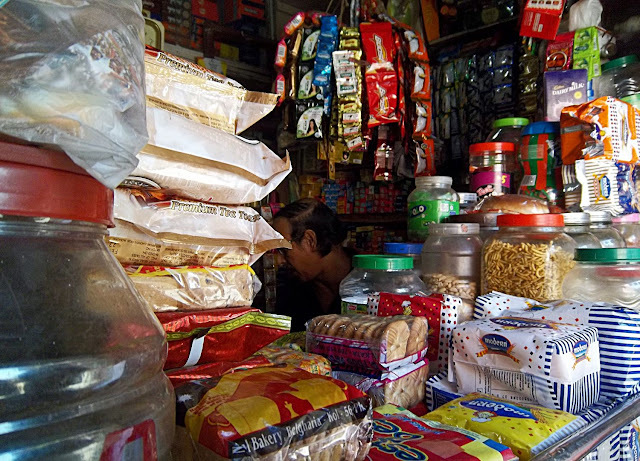 This shop is a general store or kirana shop. It sells the same thing but is located in a poorer locality. Goods may not be always genuine (adulterated?) but they are certainly cheap. A small general store in a poor locality. 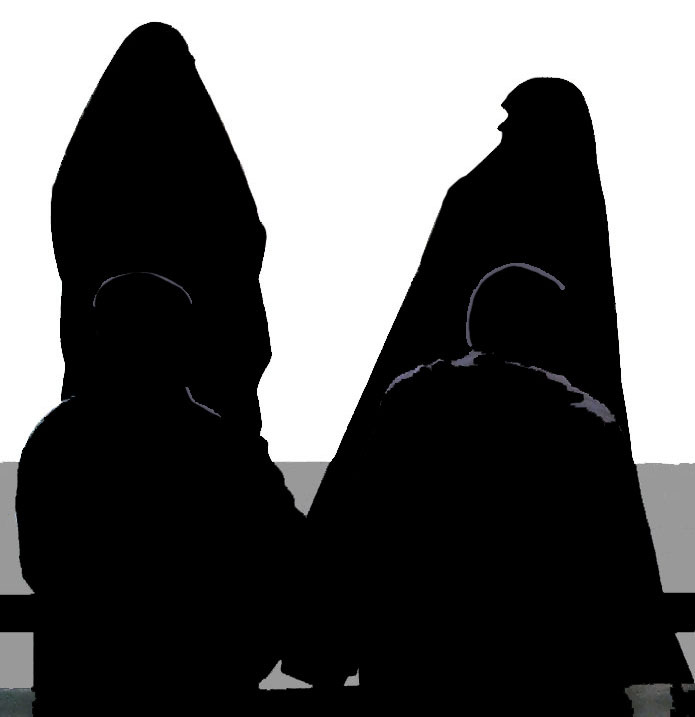 These are silhouettes of Muslim women in burkhas. 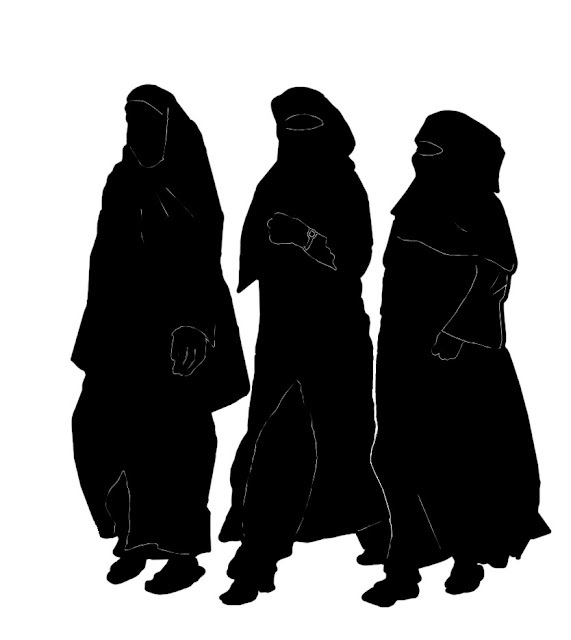 This image is of three women walking briskly, clad in burkhas or burqas. The woman on the left is not in full burkha. Her face is left uncovered. Here you can see two Burkha clad women with their husbands, all silhouettes. The men are sitting down and their wives are standing in front of them. One of my favourite pictures. 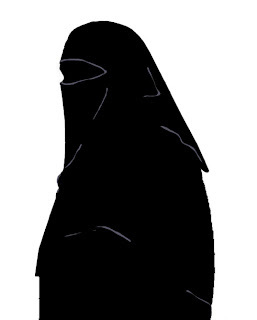 A half figure of a burkha-clad Muslim woman. Her full face and body is covered, except for her eyes. This one is a slightly different version. The Muslim woman with the burkha but her full figure is shown here in the graceful dark robes. 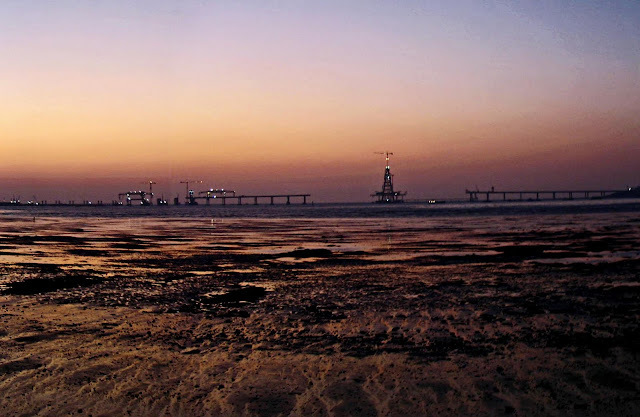 Related Images: Silhouettes of Mosques or Women in burkhas or burqas - photos or More Silhouettes of people and places of all types including monuments and people at different activities. These silhouettes of men travelers are based on photographs taken at an airport. All are silhouettes of a man with a bag or a back pack. Men or all ages and shapes with bags. Some of these travellers are in a hurry to reach their airplane, another man is sauntering around the airport, and still others have their suitcases already checked in. 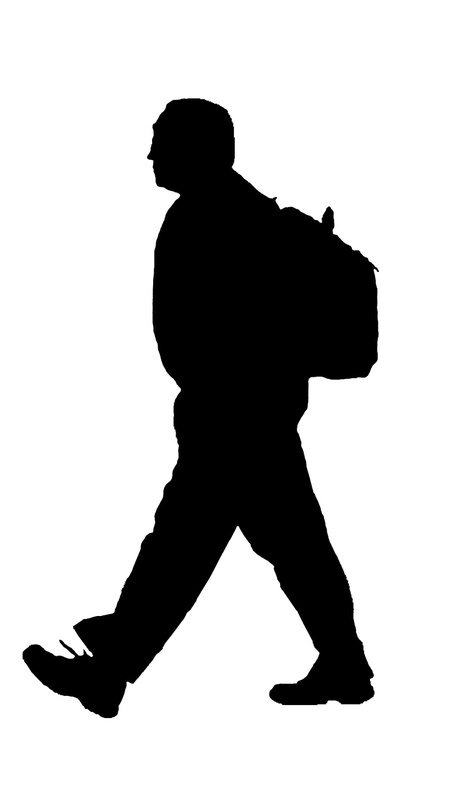 This is a silhouette of young man sauntering along with a backpack at an airport. 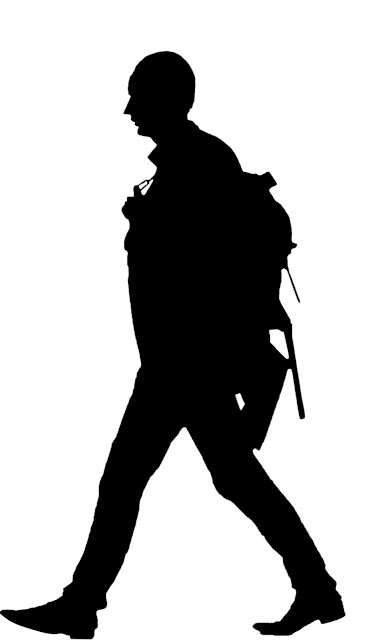 A silhouette of another another young man, barely in his early twenties striding towards the aircraft. 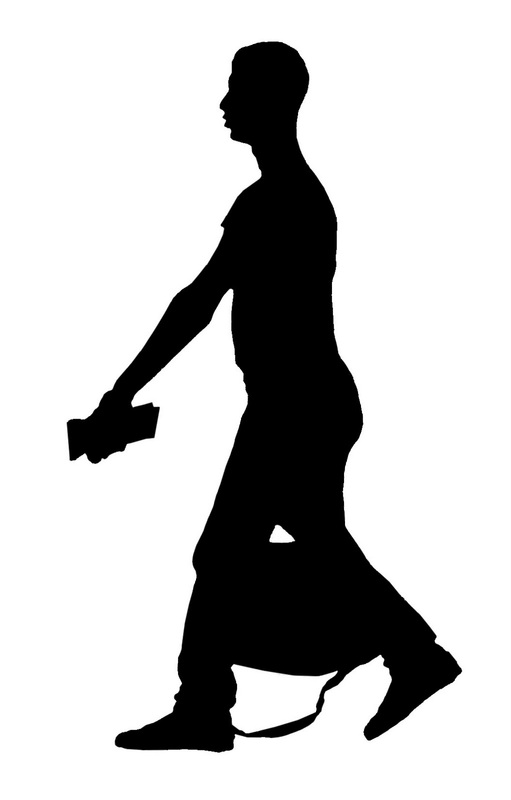 In this right hand he is carrying some leaflets or brochure and a bag is hanging loosely from his hands, its strap touching the floor. A silhouette of an Asian middle-aged man walking at the airport. A silhouette of a young man in casual clothes walking with a backpack at the airport. 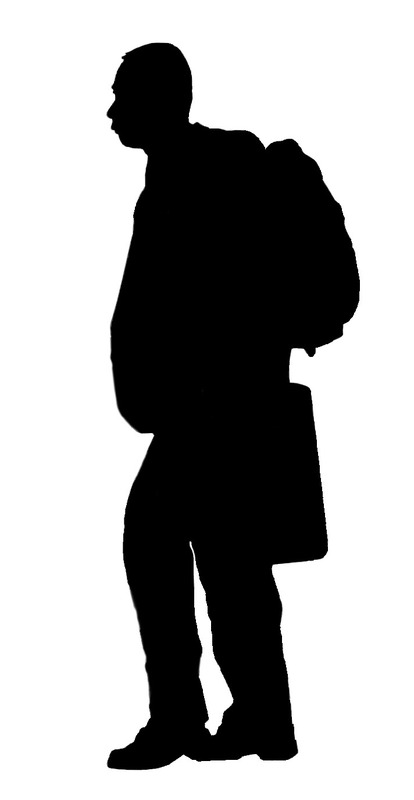 A silhouette of an older man dressed in a jacket and tight pants and pointed shoes, carrying a backpack. 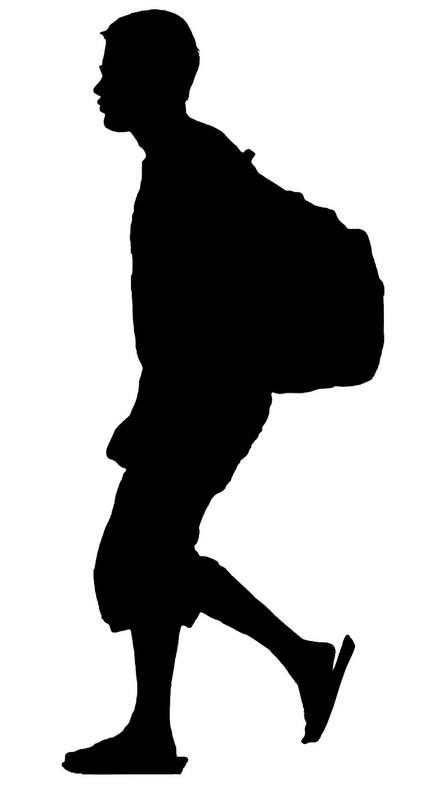 Silhouette of a man walking at the airport with a backpack and briefcase. He is wearing a jacket. Indra Market in Bangkok, Thailand, is a good place to buy goods at a reasonable rates. Value for money. Good garments at a cheap price and lots of variety and low prices. Stylish clothes, shoes and costume jewellery. If you are anywhere near Indra Square don't miss this market! This is the exterior of Indra Square. A peek inside the market. The shop-keepers are polite. The MBK market or mall is talked about a lot, but we were disappointed. Not only is it full of fake goods, the goods are defective in many cases. Worse, the shopkeepers are rude. 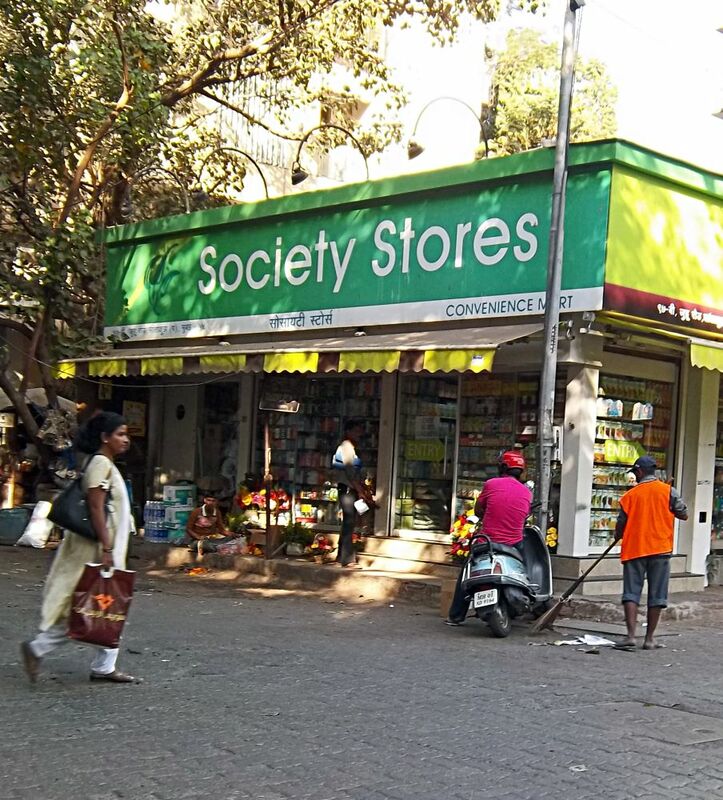 We were witness to several fights, started by the shop-keepers themselves. MBK, though conveniently located, is a market to avoid unless you are ready to ignore rude and indifferent behavior. 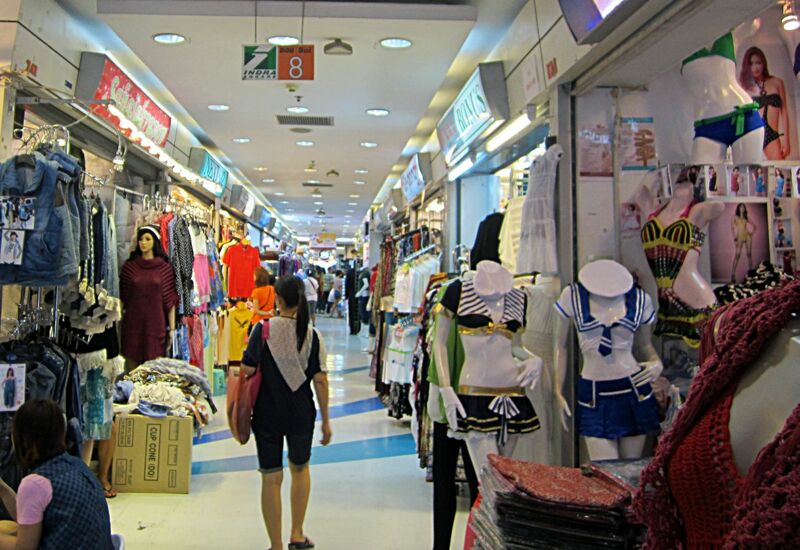 But why do that when Bangkok has so many good markets! Mind you this behavior is not because of bargaining of otherwise interacting with the shop-keepers. They just yell at you if you touch any of their goods. Or sit on a stool outside their shop because your feet are killing you. Or if you are lucky, they just completely ignore you if you ask them the price of anything! We sure were glad to leave that place and never will we ever go their again! 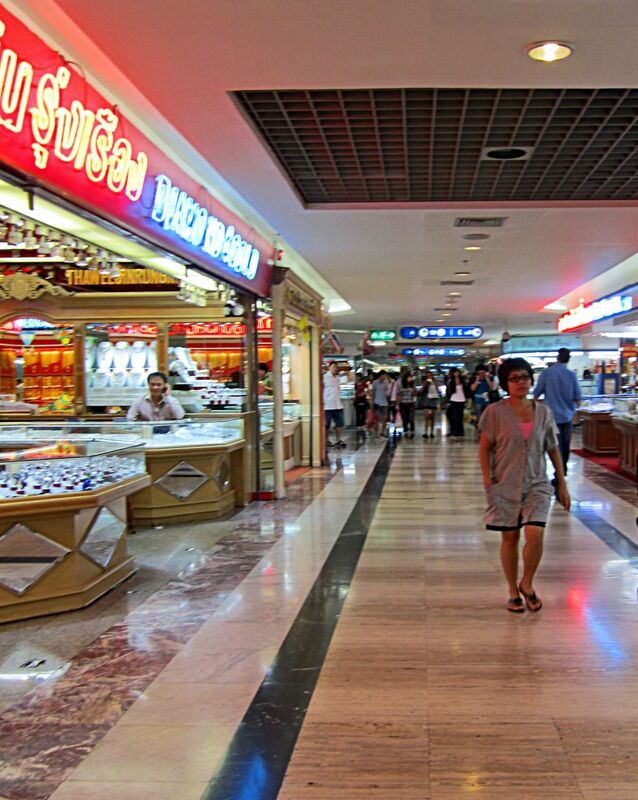 This is the interior of the MBK market. A corridor at the market. Go to this market if you are desperate for fakes but beware, the fakes are so badly tailored that they won't last long so its not value for money. 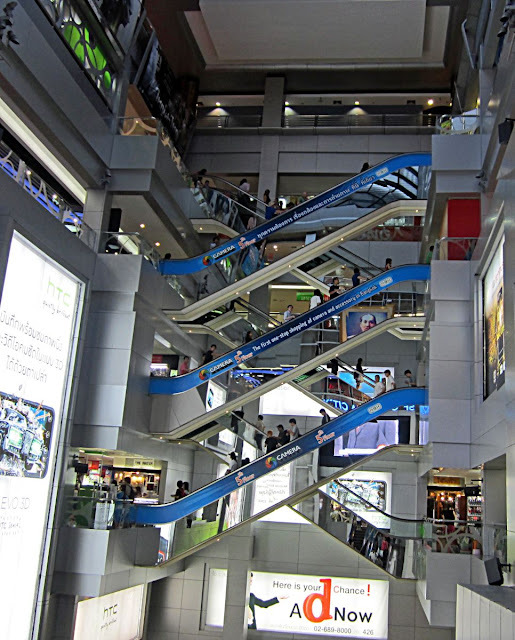 If you want to see malls and markets in India try the label "Markets"
Malaysia the second largest producer of palm oil in the world and the world's second largest exporter of palm oil. 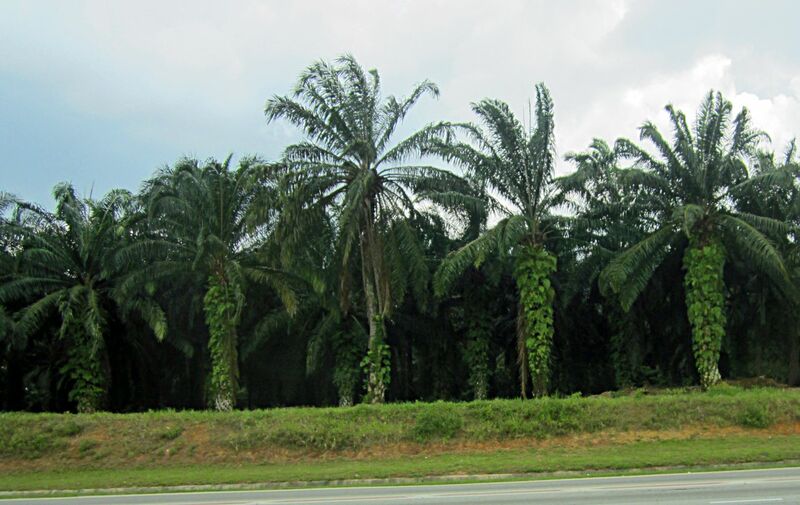 More than 60 percent of the palm oil is exported. 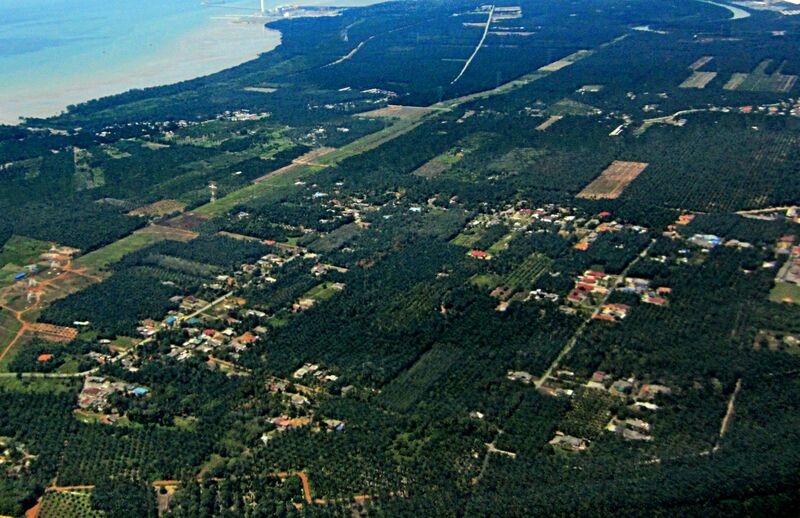 The Malaysian economy is heavily dependent on the palm oil production. These photos were shot through the double glass window of an airplane. 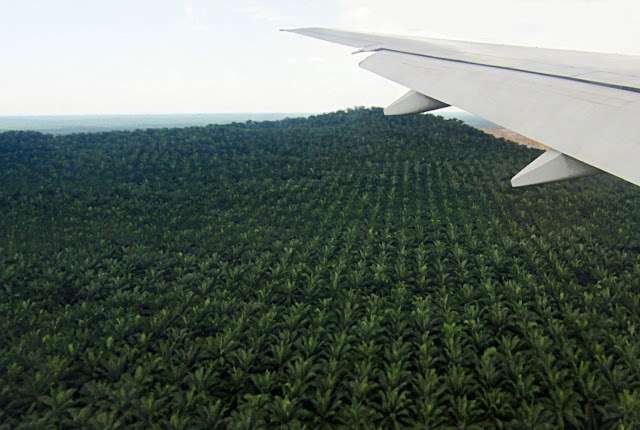 Here you can see how widespread the palm plantations are. 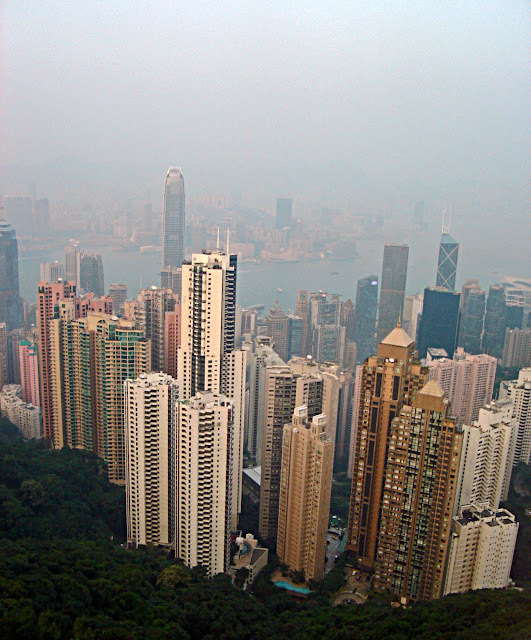 Almost every available land space is taken up by the palm trees. The palm plantations are everywhere, stretching from end to end. Another look into the distance, a binocular view. 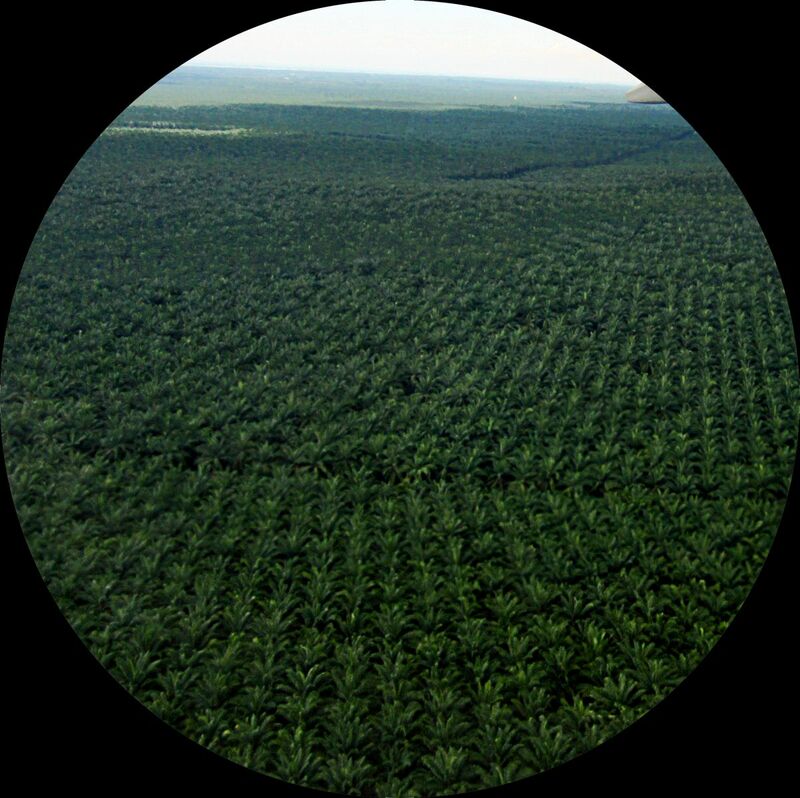 The palm plantations are enclosed in a circle against a black background. This photograph was taken through the glass window of a moving car. A close-up of the palm trees. This is a photograph of a mouth-watering chunk of cooked pork meat or pork steak. 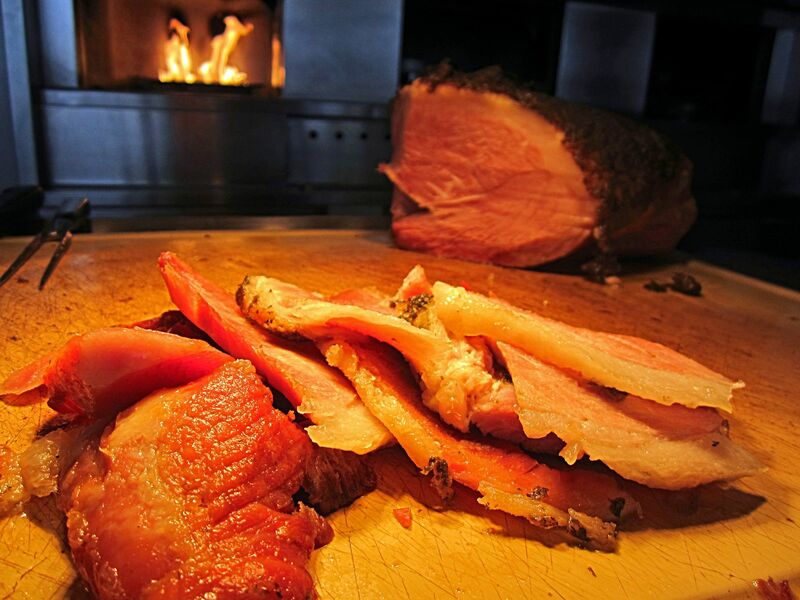 A large piece of roasted pork, looking golden and richly flavoured. In the background the fires of the kitchen oven are burning adding to the warmth of the picture. Slivers of pork have been cut from the browned pork steak. 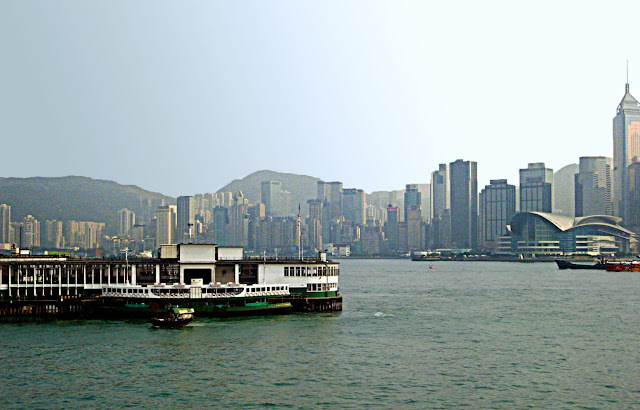 Related Images: Chinese cook making barbecued meat or Photos of frying in hot oil or Fried and roasted insects in China or Tandoor Oven, tandoori rotis and cooks. 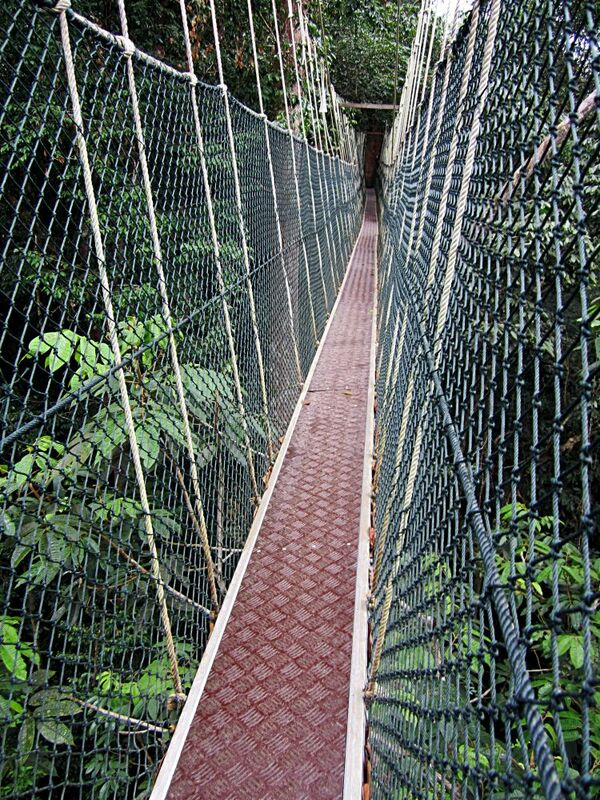 The 45 meters high and 510 meters long walkway is the longest canopy walk in the world. 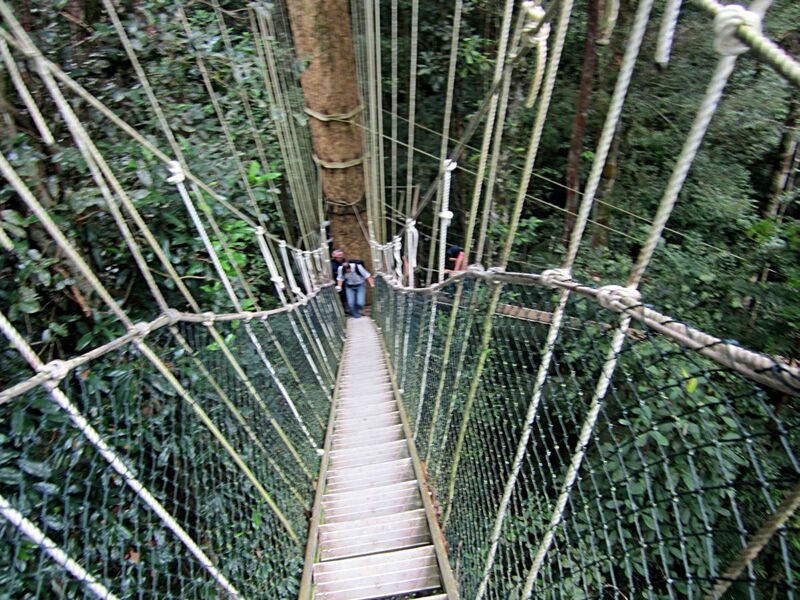 It is in a place called Tamen Negara in Malaysia's thick rain forest. 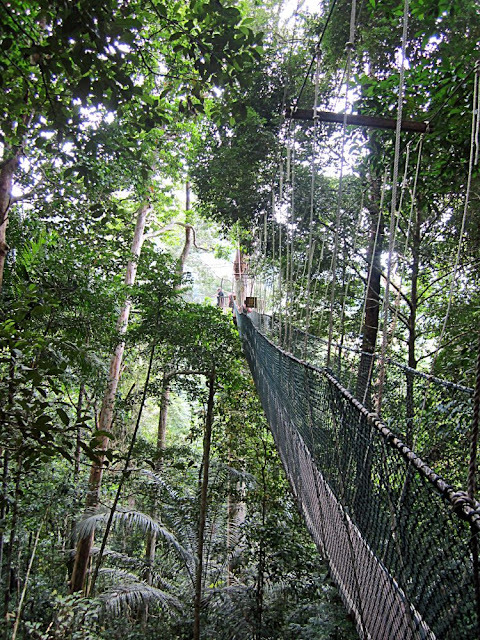 As you walk across the forest canopy you are actually walking along the top of the trees, and can the rich and diverse flora and fauna. However as they do not encourage you to stop along the way, not even to take photos, stopping to view is not so easy. Besides stopping can also result in you losing your balance and if you do, the canopy swings or you can trip. 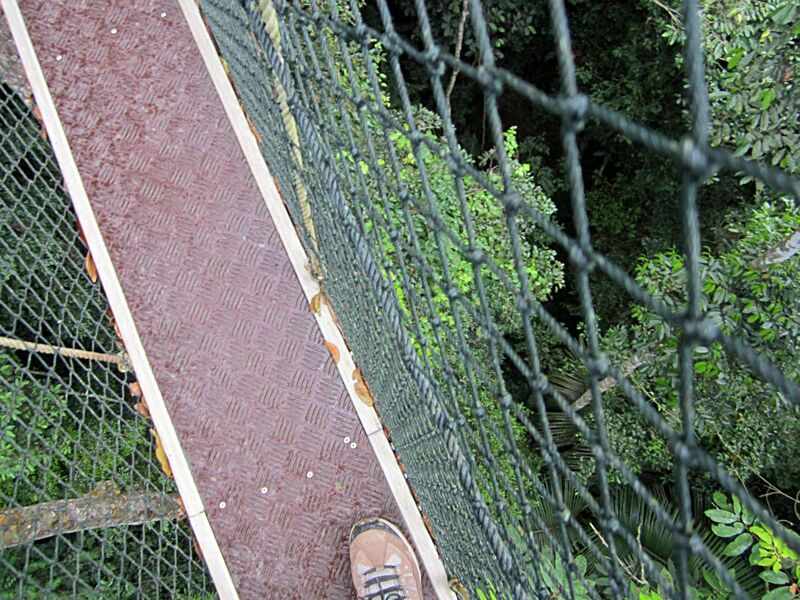 It is quite safe though due to the high ropes.The canopy walk is closed in the rainy season which is in winter. The canopy winds its way across the trees and one gets a feel of what monkeys feel like as they hop across from tree to tree! A distance of at least 10 metres has to be kept between each person walking along the canopy in case the canopy swings. Here is part of the long canopy. There are several sections, some long, some short, some steep. Here you can see how narrow the actual path is. A little to the left or the right and the canopy swings wildly. 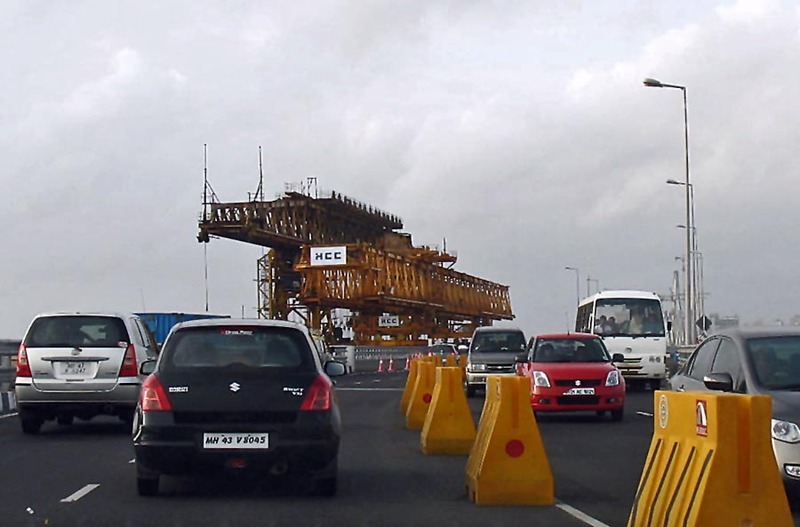 Most people are able to keep their balance though and it is a cakewalk for children! This is where the canopy walk becomes a ladder! Its fun!